When you’ve had a long day and get home later than usual, you aren’t always in the mood to spend a lot of time preparing a complicated meal. 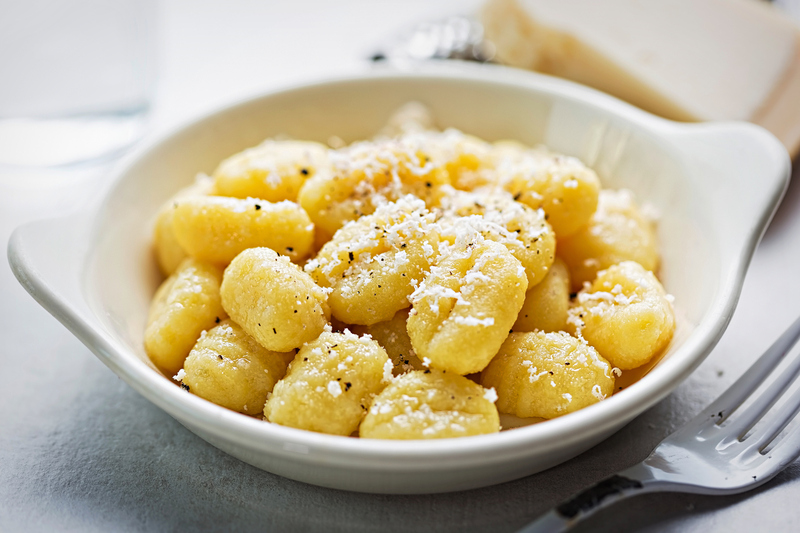 Our gnocchi with eggs recipe is just the thing to make on nights like this! This recipe only needs a few ingredients, and it’s likely that you already have most of them in your cupboard. The best part is — it’ll be ready in about a half hour. There’s not even anything you have to chop, dice, or slice. Even though our gnocchi with eggs recipe is so simple and easy to make, you aren’t sacrificing flavor. The filling potato gnocchi mixed with the herbs and spices will fill you up. Plus, the poached egg in every serving gives you extra protein to perk you up after that long and possibly stressful day. Your family will love this meal. After you cook it once, they’ll be asking for it for dinner again soon. You and your family will enjoy all the flavors and textures that come together in this dish. Follow our recipe below to learn how to make potato and egg gnocchi! Cook the gnocchi according to the package. The gnocchi is done when they float to the surface. Add the olive oil and butter to a large skillet and put it over medium heat. Add the garlic, sage, parsley, thyme, and rosemary. Saute the garlic and herbs until the garlic begins to brown. As the gnocchi finish cooking, scoop them out of the boiling water with a slotted spoon and add them to the skillet. Once all of the gnocchi are in the skillet, drain the water. Turn up the heat on the skillet and cook the gnocchi, letting them get browned. Make four indentations in the gnocchi. Crack an egg into each one and season the eggs with salt and pepper. Cover the skillet and let the eggs cook on medium heat until the whites are set. The yolk should still be a little runny. When the eggs are finished cooking, divide the gnocchi among four plates with an egg for each. Sprinkle each dish with the parmesan cheese and serve. Using Sauder Eggs in your homemade potato and egg gnocchi will make this dish even better. Our eggs are perfect for all your cooking and baking needs because they are of the highest quality. We partner with farmers who agree we should only give you the best. To find the closest store to you with Sauder Eggs, make sure you use our store locator today.